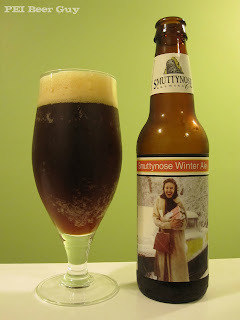 Here we have a winter ale from the Smuttynose Brewing Co. Ahh... 'tis the season to have such things. This beer's actually a dubbel/double, despite the moniker. This wintery dubbel is a deep-stream / chestnut colour, with pale, amber head - and lots of it. It billows a bit out of the place where the beer's poured in, with larger bubbles than the surrounding ones. There is fairly solid lacing. The aromas are light - pear, fig, toffee, and perhaps some apple. The flavour is more of the same (add a bit of chocolate and slight nuttiness to the mix), albeit a bit heavier (but still rather light), yet bright. I wonder if I'm picking up a hint of cinnamon? A twinge of candy apple? It is reminding me more of an Oktoberfest beer or a Munich dunkel lager than a dubbel or winter ale. The body's medium, I suppose, but the feel comes off as light overall. The carb's gentle, and the finish is smooth. Overall? It's a pretty tasty, easy-to-drink, enjoyable brew that doesn't require all of your attention. Great for staying in on the longest night of the year.